The relationship between Holden Bernier and his dog, Ruger, is beyond that of owner and pet. Ruger is a specially bred and trained diabetic alert dog whose presence will allow Holden, who has Type 1 diabetes, a level of independence he's never had before. 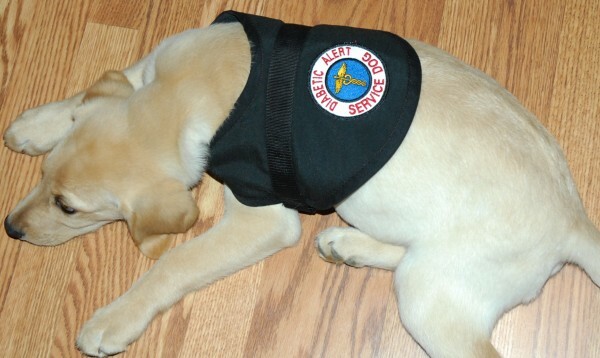 When Ruger wears his special service dog vest, he is officially on duty as Holden Bernier's diabetic alert dog. At just over three months old, Ruger has already alerted the family to a dangerous drop in Holden's blood sugar. FORT KENT, Maine — Move over Lassie, there’s a new supercanine in town and at just over three months old, his star is already on the rise. The American yellow Labrador retriever is the newest addition to the Bernier family and the pup is far more than a simple house pet. 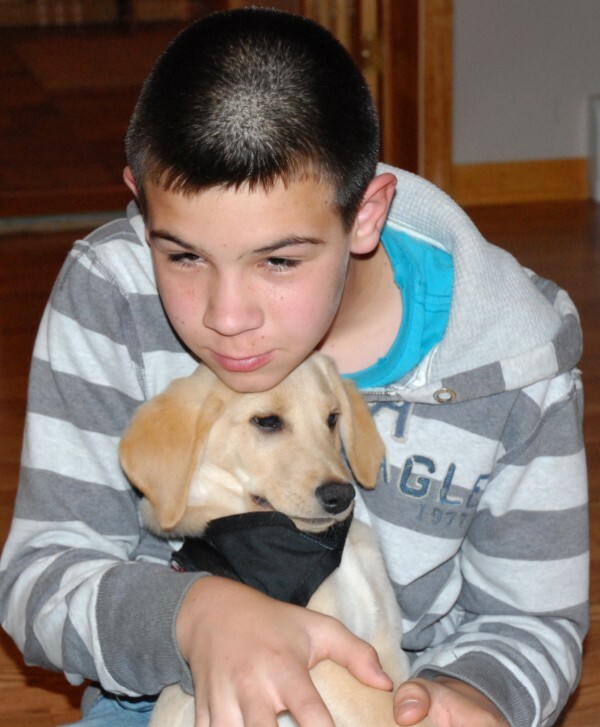 Ruger is a specially bred and trained diabetic alert dog and now holds the key to 13-year-old Holden Bernier’s independence in his furry paws. Diagnosed with Type I diabetes at 37 months old, Holden must have an adult with him at all times — home and school — in the event of extreme fluctuations in his blood sugar. But letting Holden out on his own is risky. Sudden drops or spikes in his glucose can spell serious, life-threatening trouble and rapid treatment is crucial. Holden constantly monitors his blood sugar and wears an insulin pump to help control those glucose levels, but there are times he does not feel the dangerous changes in those levels as they happen. With a scent ability that can detect levels in the parts-per-trillion, diabetic alert dogs can sniff out dangerous glucose fluctuations up to 20 minutes faster than implanted glucose monitoring systems. Changes to Holden’s glucose levels can trigger lethargy, impair his breathing, cause grand mal seizures and, if left untreated, can be fatal. Dogs like Ruger are trained to react to a rise or drop in blood sugar and not stop alerting his owner or a member of the household until someone responds. The dogs are also trained to dial 911 on special phones if the diabetic is unresponsive and alone. With Ruger by his side, Holden will be free to visit friends and explore the woods behind his house without adult supervision. The Berniers said they had never even heard of diabetic service dogs until Greg Bernier saw a clip about the dogs on television earlier this year. The dogs are bred and trained at Warren Retrievers in Montpelier, Va. Puppies range in price from $12,000 to $20,000. In the Berniers’ case, they were looking at an $18,500 purchase price for Ruger plus thousands of dollars more over the next several years in costs associated with training, veterinary care, a special diet and travel. Once the word got out locally however, the money needed to purchase Ruger was raised in a matter of months. Thanks to the outpouring of support, the Berniers have exceeded their fundraising goal, but said donations are still being accepted to help with the costs of Ruger’s training and care. It takes two years for a diabetic alert dog to complete its training, Michelle Bernier said, and during that time Warren Retrievers dispatches a trainer to the dog’s new home several times a year to work with the family. In fact, it was the trainer who hand-delivered Ruger to Holden last week after a flight from Virginia and four hour drive from Bangor. The two — boy and dog — clicked immediately. While it may take two years for Ruger to “graduate” from his training, the pup wasted no time in demonstrating he was well worth the purchase price. For now, Ruger alerts the Berniers by whimpering or making other agitated noises. Over the next two years he will learn Bernier-specific cues to alert the family on Holden’s condition. “We get to choose those cues,” Michelle Bernier said. Thanks to publicity surrounding the family’s fundraising, pretty much everyone in northern Maine is interested in Ruger, having seen or heard about him on local television, radio and print news. As befitting his rock star status, Ruger is on a special diet of holistic dog food and treats and salmon oil. Her husband agrees the addition of Ruger to the family is a major commitment, but one they are all willing to take on. Holden’s two brothers Joshua, 14, and Ashton, 9, and his sister Keardin, 11, are all willing partners in Ruger’s ongoing service dog training. Looking at his new four-legged companion sprawled out on the family’s living room floor, Holden Bernier smiled and had only one thing he would like to tell everyone who made the dream of Ruger a reality. “Thank you,” Holden said softly. Donations are still being accepted for Ruger’s care and training and may be made out to Guardian Angel Service Dogs, Attention Holden, and sent c/o Michelle Bernier, 351 Violette Settlement Road, Fort Kent, ME 04743.